The Shooting Star (known as the Twinkle Star in Japan, Europe, and Oceania) is a large bike that appears in Mario Kart Wii. It has a star on the front, a comet trail on its sides and exhaust pipes, and a gray wing on the handle bars. It is unlocked by winning the 100cc Star Cup. The Shooting Star's kart counterpart is the Honeycoupe. The Shooting Star has good speed (which is tied with that of the Super Blooper) and weight (tied with the Sprinter), along with great drift and Mini-Turbo, which are tied with that of the Wild Wing. It's mini-turbo is also tied with the Booster Seat. It has the best drift and mini-turbo of any large class vehicle. On the other hand, its off-road, acceleration (tied with the Sneakster, Mini Beast, and Piranha Prowler), and handling stats are low, and it is the lightest large vehicle in the game. The Shooting Star is also the only large vehicle to be lighter than a medium vehicle. In this case, it is lighter than the Wild Wing, a medium kart. Although the Shooting Star has a good drift and mini-turbo, it drifts outside. In fact, it has the highest speed and drift stat among all the bikes that drift outward. "To a novice racer, the benefits of drifting may be a bit elusive. But once you understand how drifting effectively sets up Mini-Turbos, you'll appreciate how the Shooting Star excels in this important stat category!" 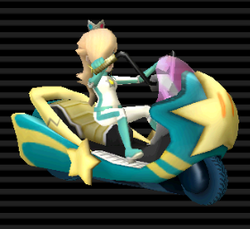 The Shooting Star is one of six vehicles in Mario Kart Wii to go through a design change other than a palette-swap, the others being the Bit Bike, Flame Runner, Wario Bike, Spear, and Phantom. In this case, the star on the side of Rosalina's Shooting Star is larger than on the other characters'. Also, hers does not have a foot rest, as the others do. In a similar manner, Bowser's and Dry Bowser's Shooting Stars have their handles positioned lower than the other Shooting Stars. The Shooting Star is the only outward drifting bike in the game that is faster than all six standard karts and bikes. This page was last edited on March 27, 2019, at 14:25.